Innate Power (Initial Side): When a fowl card is destroyed, the hero with the highest HP must either destroy one of their equipment or ongoing cards, or The Matriarch deals them (H), where H is equal to the number of heroes, minus 2 psychic damage. Advanced Power (Initial Side): Cohort cards are indestructible. 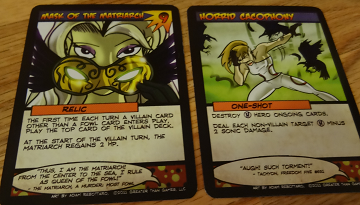 Villain Cards that Begin Game in Play: Mask of the Matriarch (9 HP): The first time each turn a villain card other than a fowl card enters play, play the top of the villain deck. At the start of the villain turn, The Matriarch regains 2 HP. How she flips to her other side: Anytime when the villain trash is shuffled into the villain deck. 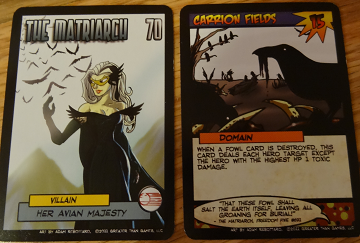 Innate Power (Second Side): When a “fowl” card enter play, The Matriarch regains (H) minus 2 HP. When a fowl card is destroyed, The Matriarch deals the hero target with the lowest HP 1 psychic damage. Advanced Power (Second Side): Increase damage dealt to hero targets by 1. Most Fiendish Ongoing Card: There aren’t any, but she doesn’t need any. 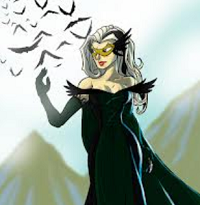 Most Fiendish One-Shot Card: Darken the Sky: Put all of the fowl cards from the villain trash into play. If the card “Mask of the Matriarch” is in the villain trash, put it into play. Most Fiendish Villain Target Card: Huginn (7 HP): At the start of the villain turn, destroy X hero ongoing and/or equipment cards, where X = the number of cohorts in play. At the end of the villain turn, put Muninn from the villain trash into play. How to Defeat The Matriarch: You’ll want to have global damage. That’ll take care of those pesky fowl cards. The Matriarch’s cohorts can cause headaches, too. While you don’t want either one of them in play, you definitely don’t want both of them in play at the same time. What makes matters worse is that when either “Huginn” or “Muninn” are in play at the end of the villain turn, they put the other one in play from the villain trash. Alter your strategy accordingly. If one of them is in play and the other is in the villain trash, focus all your damage on the one in play. “Carrion Fields” can cause mass damage for heroes as well, so you may want to get rid of this card, too. But with 15 HP, “Carrion Fields” can be a bear of a card. The Matriarch earns her top rating as a hero killer.